Cybercrime expert explains anyone with technical knowledge, a malware and the help of an insider could easily hack an ATM machine. 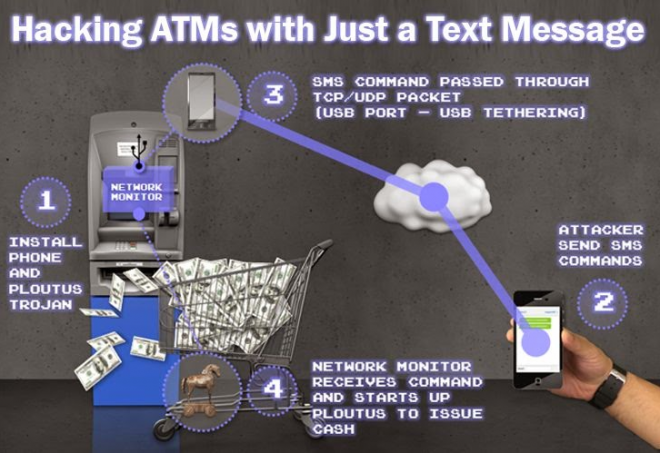 A RM100 chip, specific technical knowledge and a free malware obtained over the Internet is all the necessary to hack Automated Teller Machines (ATMs), this is the opinion of a cybercrime expert, which released an exclusive interview to the FMT (freemalaysiatoday.com). The cybercrime expert was invited to report in regard to a recent hacking case of 17 ATMs, a Latin American gang of cyber criminals was able to hack and steal millions of dollars from the automated teller machines in Malaysia. The hackers steal more than $1.2 million from ATMs of at least 17 bank branches belonging to United Overseas Bank, Affin Bank, Al Rajhi Bank and Bank of Islam were reportedly hacked into by the Latin American gang. The Closed-circuit television (CCTV) footage from the banks showed that 2-3 Latin American men entered and withdraw money from these targeted ATM machines. “What you need is a mastermind, a RM100 computer chip and possibly a bank ‘insider’ to execute the attacks.” he said. The 17 ATM hacks must be a warning for the banking industry that according to the expert is loosing field in the fight against cybercrime. A little information is needed to the attacker, the knowledge of the targeted system could be enough to compromise a banking ATM, all this information typically provided by insiders. “He (the hacker) will know where the locks and connections are, the model of the machine, the level of security and the version of the operating system.” explained the expert. According to the expert, the hack of an ATM machine could be very easy using malware easy to find in the underground, a security expert has no problem to wreak havoc on the actual banking system. Based on his experience in the sector, the expert highlighted the wrong approach of the banking industry in the protection of ATMs machines, in many cases these machines run out dates OSs, lack of patch management or they are poorly configured. The results of the penetration testing session demonstrate the presence of several weaknesses in the banking systems, in many cases the ATMs were running on outdated operating systems like Windows XP. “Banks have been taking things for granted because nothing like this has ever happened before.” the expert added.“They depended heavily on the CCTV and in some locations, they do not even have security guards. The experts involved in the test also discovered many other serious flaws in the ATM, lack of encryption could expose sensitive data to tampering advantaging the hack of these machines with a malware based attack. The post ATM hacking easily with RM100 chip and a free malware appeared first on Security Affairs.